CD 4011 contains four 2-input NAND gates in a single package. All the gates are independent in operation except for the common power supply and ground. CD 4011 comes in the 14 pin DIP (Dual In Line Package). 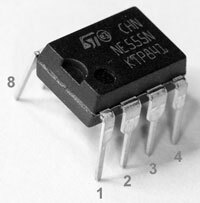 Unlike other digital integrated circuits, all the unused inputs of the IC should be either connected to the positive rail or ground. No inputs should be left floating as this may cause erratic operation of the IC. 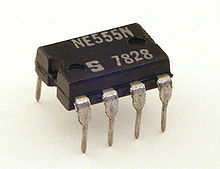 Timer IC 555 is widely used in both analogue and digital circuits to generate short duration pulses. It can be designed as Monostable and Astable multivibrator and also as Bistable, Schmitt trigger etc. In the Astable Mode, the output gives high and low pulses based on the value of timing resistor and timing capacitor. The Note given here is useful to calculate the frequency of oscillation and timing cycle.